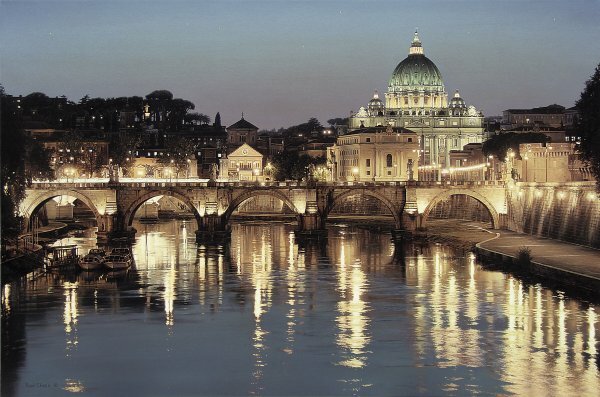 "This view is from across the Tiber River looking toward St. Peter's. I spent an hour or so photographing this scene during the twilight hours on our last night in Rome. The composition is based on one specific photo while dozens of additional photos were used to provide details for the architectural features. I especially enjoyed painting the reflections on the water, an exercise in abstract line and shape. The colors were muted to faded blues and Terra Cotta tones, which provide a more monochromatic color scheme representing the incredible history and beauty in Rome, and Italy in general." St. Peter's (Italian San Pietro) is a major basilica in Vatican City, an enclave of Rome. Until recently, St. Peter's was the largest church ever built (it covers an area of 23,000 square meters with a capacity of over 60,000 people), and it remains one of the holiest sites in Christendom in the Catholic tradition. It is the most prominent building inside the Vatican City, and its dome is also a dominant feature of the Roman skyline.